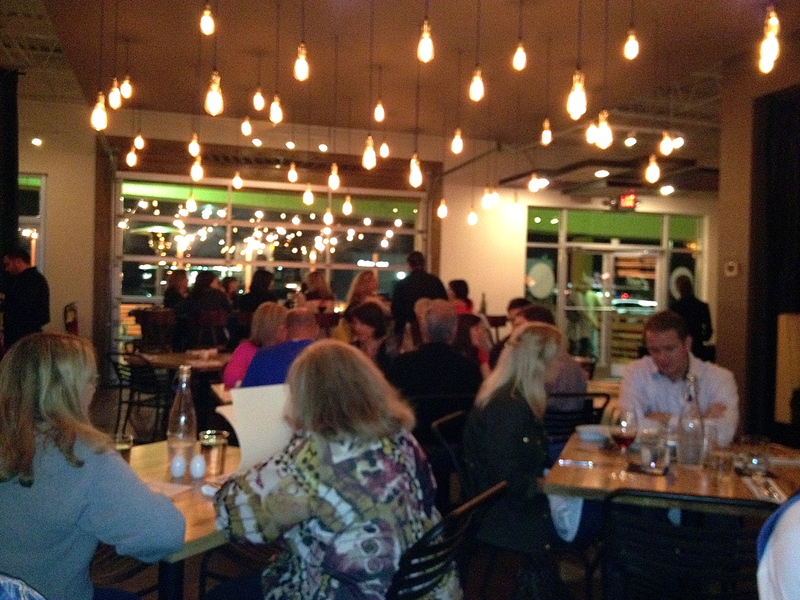 Up until recently, there was a dearth of good restaurants near Date Night Headquarters in East Cobb. Seed Kitchen and Bar opened, but there were problems with a pork chop on our visit (Date Night #55, 12/28/2012). Then came the Common Quarter (Date Night #92, 11/1/13) and the case of the missing meat loaf. Now comes Zeal, situated about a half of a mile between Seed and Common Quarter. Will Zeal have zest in their cooking? 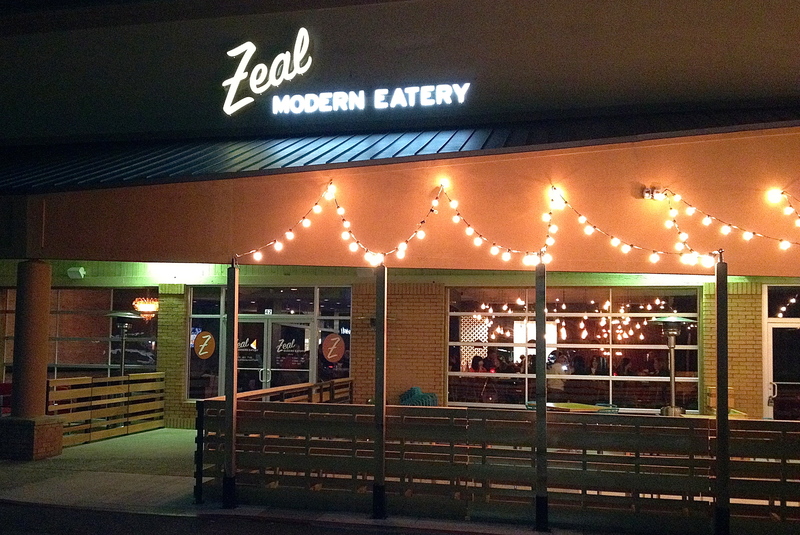 Zeal is in a space that was a Chinese restaurant for decades. Buddha has left the building, and a lot of money has been spent to convert the restaurant. There’s a bar to the left and dining to the right when you walk in. Two large garage doors and two outdoor areas show promise for the spring, but on this damp November night, everything is closed up tight. We arrive on time for our 7:15 reservation and are seated immediately. That means it’s time for beer. The glasses are a nice touch. Ours are filled with two of the fourteen beers on tap. Eve goes for the Rogue Hazelnut Brown on the right, which is full of malts that give it a nutty flavor. Although I have had it many times before, I choose the Wild Heaven Invocation probably because I just read Grant Goggans’ excellent article on Wild Heaven beers. There are another 20+ bottled beers available, and if you are not a beer person, the drink menu at Zeal is large and reads like a book. We are hungry and order an appetizer. 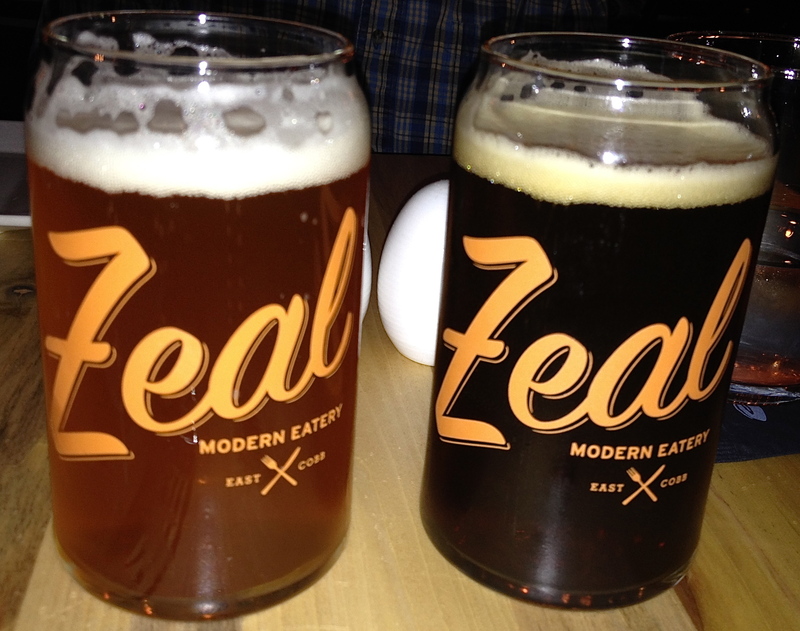 While we wait for the food, we should mention that Zeal is open for about one month when we visit. The growing pains are evident on a busy Friday night. Someone tries to deliver the wrong food to the table next to us. Someone else delivers the wrong order to us. We wait over 20 minutes for the Corn Meal Dusted Zucchini. 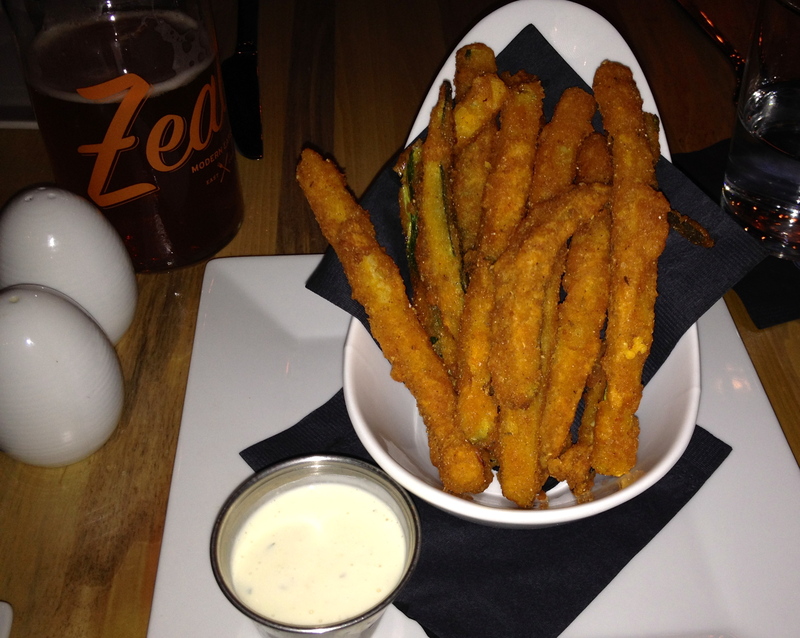 It’s fresh and hot, our server tells us when the fried sticks are finally delivered. It’s crunchy on the outside and moist on the inside. There is a lemon aioli sauce for dipping that has ranch dressing flavorings. To get a good sampling of the menu, we decide to order a flatbread and two “share plates”. 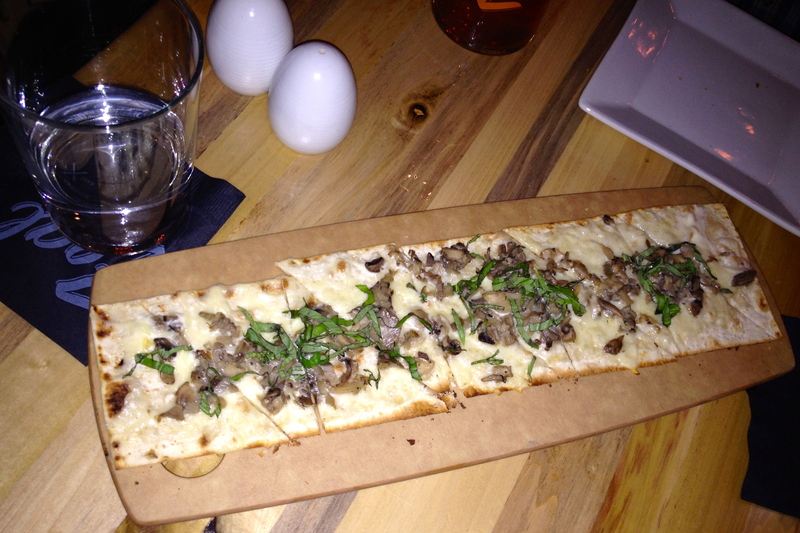 The mushroom, truffle and asiago flatbread comes on a crispy crust. This must have been good because it didn’t last long on its rectangular board. Date Night is all about sharing, so the “share plates” must be made for us. You can order a small share plate or a large one. The small is a good portion for one person. 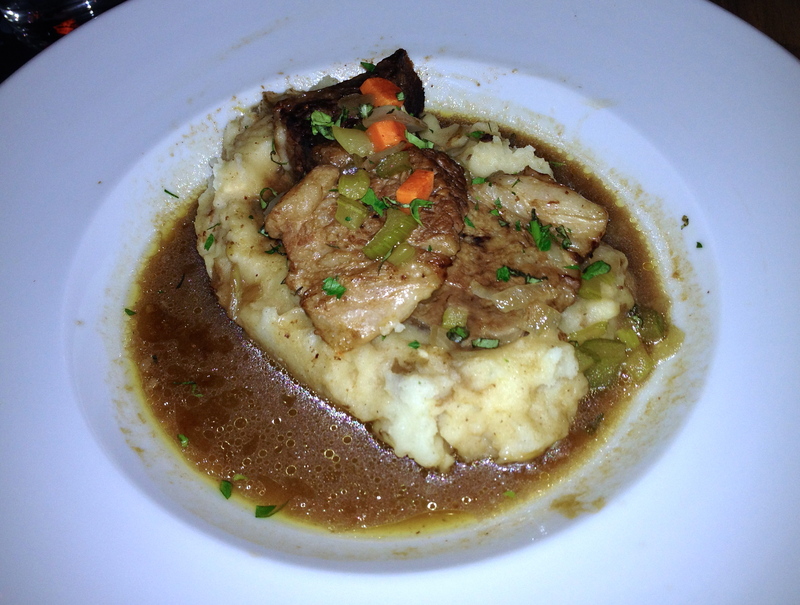 First up is the short ribs, which come on a large bed of garlic mashed potatoes. The ribs are tender and a little bland, just the way I like them. You’ll want to smear the gravy all over the potatoes. Eve gets what turns out to be the best dish of the night. The Georgia trout is crispy and coated with a light breading that keeps it moist on the inside. 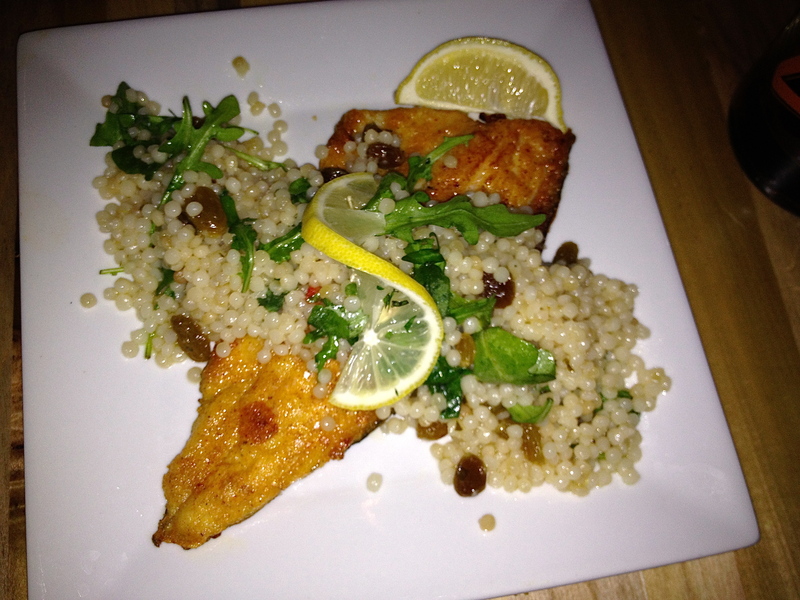 The Israeli couscous steals the show from the fish, with large grains and raisins. After sampling all these dishes, Date Night is too full for dessert. The chocolate peppermint brownie is tempting, but we pass this time. The Bottom Line on Zeal: It’s better than Seed, which we feel is overrated. It’s on par with a nearby Marlow’s, which has similar food. 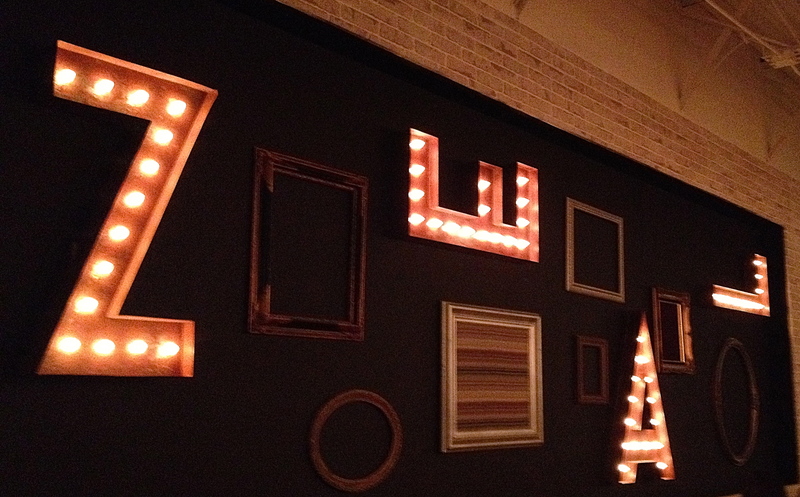 Zeal is much like Common Quarter–the food and service are good, but the “newness” is evident. A case in point: we order everything together and ask that it not be brought out at the same time. Our request is honored, but there are 20+ minutes between each course, which seems long. We have nowhere else to be, but we are there for almost two hours, which may be too long for some readers. The Executive Chef comes from Maggiano’s, where they know how to get food out quickly to a lot of people. To ensure their success, Zeal needs to put a little more zip into the kitchen.